Purple coneflower | Horticulture Talk! 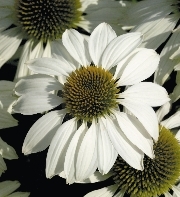 The seed catalogs have been piling up here, and as always, one of my favorites are the Echinacea. As things have been slow (and my only other activity is shoveling), I thought it would be a great time to write up a little bit about Echinacea so you become a lover of them too! Commonly known as the coneflower, Echinacea purpurea is a native to Central and Eastern North America. It is a member of the Asteraceae family, having both ray and disc flowers working together to make a composite ‘flower’. The name comes from the Greek word “echino,” meaning spiky or prickly, because of the flowerhead’s center disc flowers. All of the flowers are perfect, meaning that they have both male and female parts. Pollination occurs with the aid of butterflies and bees. In addition to its native landscape and prairie appeal, the herbal and medicinal use of Echinacea has been documented through the years. Herbalists use the roots and herbs of Echinacea to treat various infections and maladies. It offers a general boost to the immune system, and has antidepressant properties. A different species than the typical garden coneflower, Echinacea angustifolia, was used by Native Americans to soothe sore throats, headaches or coughs (symptoms of the common cold). 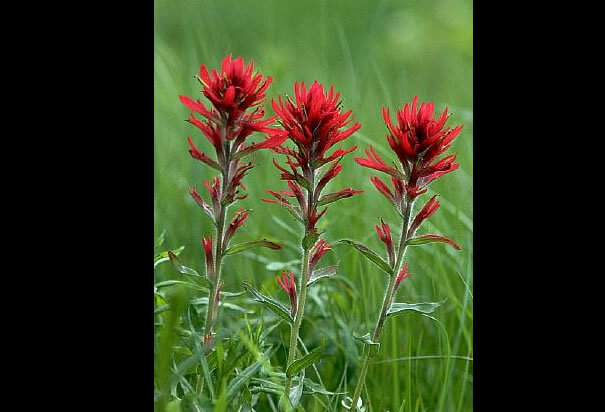 They discovered the plant as a medicinal after observing that elk sought out the plant and ate it when wounded or sick. In the mid-19th century Echinacea was used as a pain reliever and increased in use as an herbal medicine through the 1930s in America and Europe. The plant Echinacea purpurea contains the chemical compounds cichoric acid and caftaric acid. These phenols are common to many other plants. Other phenols include echinacoside (found in Echinacea angustifolia and Echinacea pallida roots). Other plant components that contribute to health effects include alkylamides and polysaccharides. You’ll find wild native-growing Echinacea in sunny, dry open woodlands and prairies. The plant prefers loamy, well-drained soil, but it is little affected by soil pH. Cultivated Echinacea offer reliable performance as a perennial plant under a wide variety of conditions. Echinacea can be propagated from seed or vegetatively using various techniques, such as division, basal cuttings or root cuttings. Today, more gardeners are seeking out perennial plants as long-term investments that offer good value of aesthetic beauty at an effective cost. 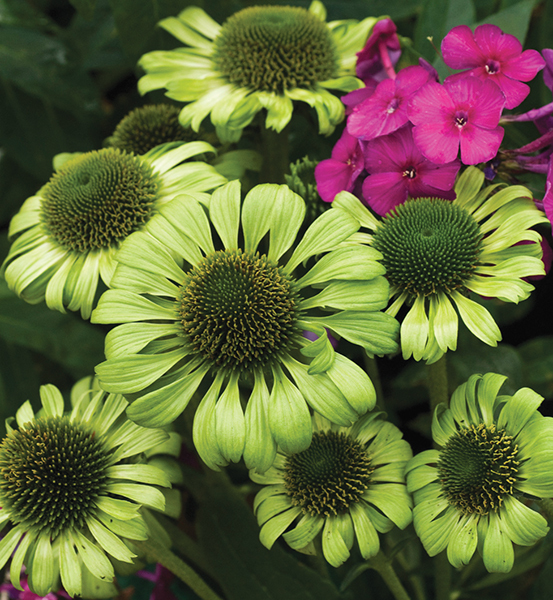 To supply this new demand for perennials, Echinacea has been one of the plants seeing a significant growth in breeding activity. Breeding trials have resulted in bringing free-flowering plants to market that overwinter successfully in cooler zones. Historically, Echinacea with bolder color hues (red, yellow, orange) have been grown from tissue culture liners. This propagation can lack good winter hardiness and may not bulk up in size in subsequent seasons. However, recent breeding has developed seed-grown varieties selected specifically for their bold coloring and trialed for overwintering success to USDA Zone 4. Echinacea is attractive to birds, bees and butterflies making it a great choice for a pollinator-friendly garden. It is generally deer resistant. Because of their root structure, the plants are drought tolerant and can withstand heat and wind. Used in garden borders or backgrounds, Echinacea adds color and texture for a wildflower or prairie-style garden. For best visual impact, plant in masses. Deadhead florets to encourage further blooms. Echinacea flowers through the summer (June through August). Its seed heads can be left to dry on the plant to feed wild birds through the fall and winter. 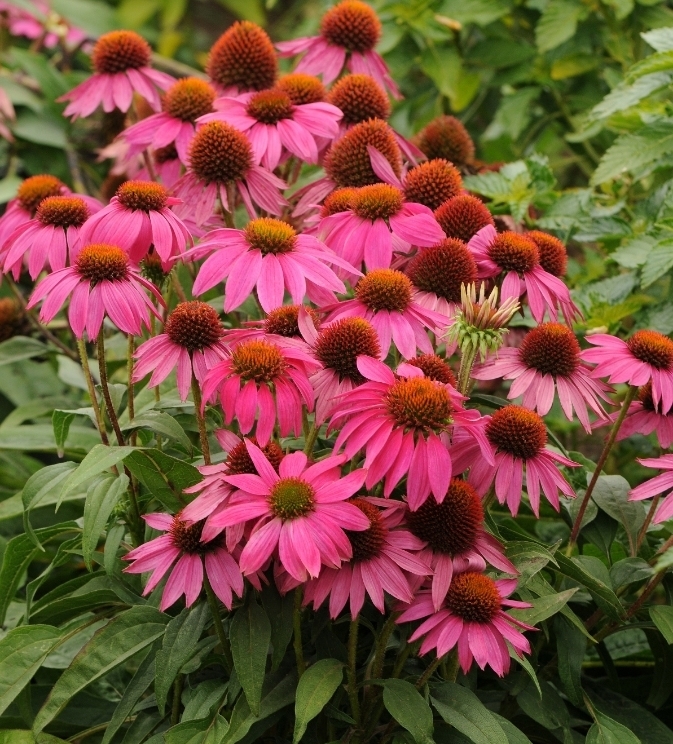 Echinacea plants will reseed in the fall, with new flowers growing the following season. Hardiness zones vary by variety, with a range from USDA Zone 4-9.